Today, starting at 10:00 AM EDT, former FBI Director James Comey will testify before the Senate Intelligence Committee on Russian interference in the 2016 U.S. presidential election and Donald Trump's attempts to disrupt investigation thereof. And here is my piece about his prepared openning remarks, which were made public yesterday, apparently at his request. Because I am the brokenest of broken records, I will just caution once more—especially for people who didn't go through Fitzmas, whether because of youth or inattention—to maintain reasonable expectations about what will come out of today's hearing. It probably won't be explosive, and, even if it is, there is no guarantee of consequences, given that Republicans are the ruling majority on the committee. I'm not trying to be a downer. Be cautiously optimistic that our democratic institutions are still capable of functioning as they should! I'm just seeing a lot of what I would classify as overexcitement and unrealistic expectations about what will happen today, even and especially from journalists who should know better, so, for people who trust my experience and rely on my assessments, I just want to encourage a more measured approach to today. Anyway! 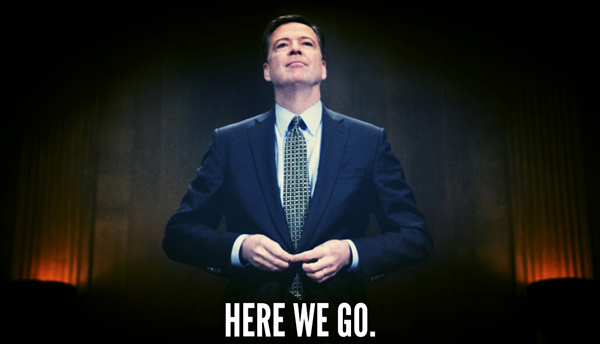 This thread will serve as the central discussion point before and during Comey's testimony, which begins shortly.